When thinking of religion in India, Hinduism readily comes to mind. However, Tibetan Buddhism is also thriving, especially in the mountains of northern India close to the Tibetan border. Many monasteries were established in remote Jammu and Kashmir (particularly the Ladakh and Zanskar regions), Himachal Pradesh, and Sikkim after the Indian government allowed Tibetan Buddhist exiles to settle in India in 1959. We gathered information on ten of the most important Buddhist monasteries in India. Although it's not the most spectacular looking monastery, Hemis monastery is the largest and richest Buddhist monastery in the Ladakh region. The monastery existed before the 11th century but was reestablished in India in 1652. It houses a famous collection of ancient statues, sacred thangkas, and various other artifacts. During the tourist season, it's possible to stay at the monastery and participate in the Hemis Spiritual Retreat run by the monks. Simple accommodations and food are provided. Some villagers also offer homestay accommodations to visitors. Location: Nearly 50 kilometers southeast of Leh, just off the Leh-Manali Highway, in the village of Hemis. The high altitude Hemis National Park is close by. Don't Miss: the annual Hemis Festival, held in June or July each year, with its captivating masked dance. More Information: Visit the Hemis Monastery website. As well as being the second most prominent monastery in Ladakh, Thiksey monastery has a remarkable setting covering one side of a hill. Its numerous buildings are arranged in ascending order of importance. Some people liken it to a small white-washed town, with a slightly fairytale look. The monastery is a favorite with tourists, many of whom consider it to be the best monastery in the region. One of the highlights there is the Maitreya Temple, which contains a towering 15 meter (49 foot)-high statue of Maitreya Buddha. It was built to commemorate the visit of the 14th Dalai Lama in 1970 and took four years to complete. There's a souvenir shop and cafe on the premises and an inexpensive hotel on the main road. Location: Around 20 kilometers southeast of Leh, just off the Leh-Manali Highway. More Information: Visit the Thiksey Monastery website. If you're into trekking, the isolated Phuktal monastery should definitely be on your list of monasteries to visit. Its construction out of the mouth of a huge cave (Phuk means cave) and down into the side of a cliff, fronting a gaping gorge, is simply awe-inspiring. There's a river below, and visitors must cross a suspension bridge to reach the monastery. During the monsoon season, water pours from the mouth of the cave. The monastery itself is not in the best condition, although its almost impossible location more than makes up for it. Location: In the Zanskar region of Jammu and Kashmir. The administrative center, Padum, is the closest town. From there, it's a two-and-a-half- or three-day trek to the monastery. There are five main Tibetan Buddhist monasteries in Spiti: Ki, Komic, Dhankar, Kungri (in the Pin Valley), and Tabo. Inside, they're filled with mystical, dimly-lit rooms and ancient treasures. You’ll be able to unearth well-preserved artwork, scriptures, and statutes as you delve into the Tibetan Buddhist religion. Tabo is unforgettable for its dozens of meditation caves, large and small, dug into the mountain by hand. You can walk up to them and spend some time in quiet contemplation. The largest monastery in India and perhaps the most superb tourist attraction in Arunachal Pradesh, Tawang monastery is precariously perched at 10,000 feet above sea level, near the border of Bhutan. Appearing like a fort, it has ravines on two sides. The monastery's prayer hall is magnificently decorated, and early risers can catch the monks performing prayers at dawn. Location: Above Tawang town in Arunachal Pradesh. It's reached via Guwahati in Assam and Bhalukpong in Arunachal Pradesh. A new cable car transports tourists up to the monastery from the town. Do note that Arunachal Pradesh is a restricted area and ​permits must be obtained. Don't Miss: visit during the annual Torgya Festival in January to see the famed masked dances. There are around 200 monasteries in Sikkim. However, Rumtek is the largest and one of the most visited ones. This colorful, grand monastery dates back to the 9th century in Tibet but was reestablished in the early 1960s in India. It's been surrounded by controversy and even subject to violent altercations and invasion from some monks who dispute its lineage. Hence, don't be surprised to see high security at the monastery. The monastery holds plenty of activities, including chanting and ritual services in the mornings and evenings. There are also impressive masked dances during the annual group meditation (Drupchen) in May or June and two days before the Tibetan New Year (Losar). To get the most from your visit, spend a few days at a guest house and visit the nearby Old Rumtek Gompa and Lingdum Gompa. Location: Rumtek village, on a hill around 25 kilometers (but nearly two hours' drive on windy roads) from Gangtok. A steep 15-minute walk is required to reach the monastery, so it's not suitable for the elderly to visit. Foreigners must carry passports and Sikkim permits. More Information: Visit the Rumtek Monastery website. Most importantly, the Tsuglagkhang Complex contains the official residence of Tibetan leader, the Dalai Lama. Other attractions there are the Tibet Museum, Namgyal Gompa, Kalachakra temple, and the much revered Tsuglagkhang temple. 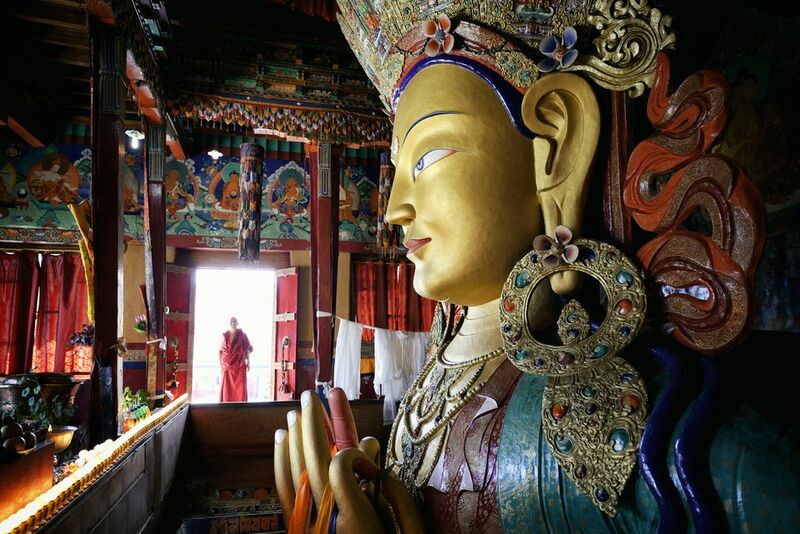 A three-meter-high gilded statue of Sakyamuni Buddha is enshrined inside the Tsuglagkhang temple, while the Kalachakra temple has mesmerizing murals. Monks can be seen engaging in lively debate during the afternoon in the Namgyal Gompa. There's also a bookshop and a cafe that cater to visitors. If you're feeling spiritually inclined, follow the Buddhist pilgrims to take a ritual walk around the complex (in a clockwise direction) amidst fluttering prayer flags in the forest. Location: Temple Road, Dharamsala, Himachal Pradesh. Palpung Sherabling Monastic Seat has an enviable setting on 30 acres of peaceful pine forest, backed by snow-capped mountain peaks. Footpaths and walking tracks wind through the forest, making it even more idyllic and rejuvenating. The monastery is fronted by a row of large stupas at the entrance, and a towering golden Buddha statue presides over the prayer hall. There's a comfortable Visitors' Retreat Center, and Hay House holds yearly spiritual retreats at this monastery. If the sound of monks chanting appeals to you, the monks from Palpung Sherabling have won a Grammy award for their chanting CD. Location: In the Kangra Vally of Himachal Pradesh, around two and a half hours from Dharamsala, between Bir and Baijnath. Do stop in at the delightful Four Tables Cafe & Gallery in Bir for great food and relaxation. Boutique accommodations are also available there. More Information: Visit the Palpung Sherabling website. Mindrolling monastery (pronounced MINH-droh-lyng) is one of the major monasteries of the Nyingma school in Tibet. It was reestablished in India in 1976 and has since grown to be a recognized center of learning, with one of the largest Buddhist institutes in India. The Great Stupa, opened in 2002, will be of most interest to visitors. Measuring 185 feet tall and 100 square feet wide, its precise design transforms and harmonizes imbalances in elements and energies. Apparently, it's the largest stupa the world. Inside, there are numerous shrine rooms with elaborate murals and sacred relics. Visitors can relax in the tranquil landscaped gardens surrounding it. Location: In the foothills of the Himalayas in Dehradun (Clement Town), Uttrakhand. More Information: Visit the Mindrolling Monastery website. If you can't make it to the mountains to visit any of the Buddhist monasteries in India, Namdroling Nyingmapa Tibetan Monastery and Golden Temple in south India is well worth seeing instead. The Tibetan settlement there is said to be the second largest in India. The amount of gold in the prayer hall and temple is quite overwhelming, as too are the immense gold statues of Buddha. Location: Bylakuppe, near Kushalnagar, around an hour east of Madikeri in Coorg, Karnataka. Do note that the area is a restricted one, and foreigners require a Protected Area Permit to stay overnight at the monastery. As an alternative, accommodations are available in Kushalnagar. More Information: Visit the Namdroling Monastery website.